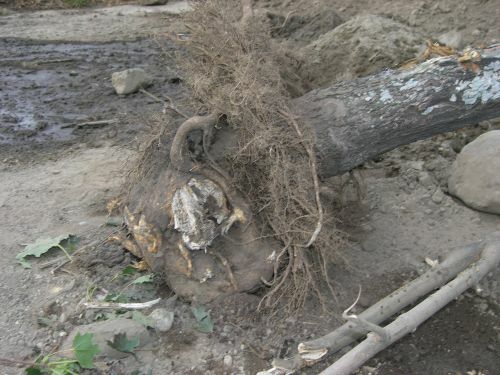 Another question asked at last week’s New England Grows about bare-root transplanting was “How do you make sure the roots don’t dry out?” The answer, of course, is that you water the tree you’re moving. 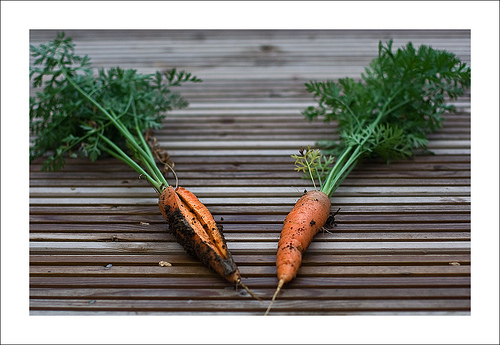 You water it thoroughly a couple of days before the transplant, to insure that the tree’s tissues have good turgor pressure and moisture reserves for the bare-rooting. You take a break every now and again during the blow-out (if you’re using compressed air) and spray down the exposed roots with water. 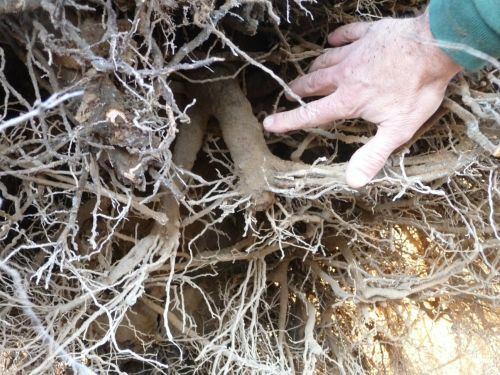 You may spray more water on the roots — the top, bottom, and inside of the root mass — when you pick the tree up on forks to deliver it to its new home. 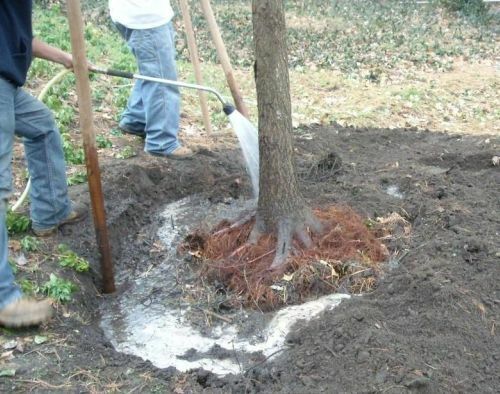 You ‘mud in’ the tree as you backfill, saturating the backfill soil with water to eliminate any air pockets and again, to combat root dessication. And once you have mulched the tree well, you water still more. Water in all phases of the operation is key to tree transplanting. Cornell’s Urban Horticulture Institute advocates using a hydrogel slurry to hold water on the bare roots during planting. 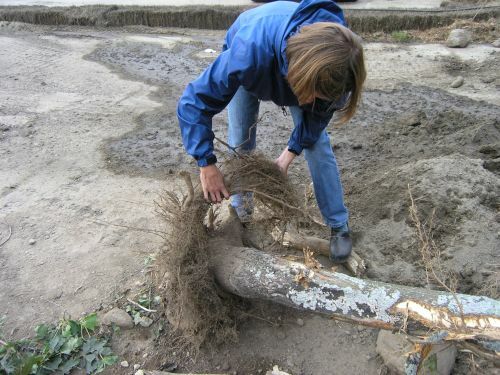 Their excellent Creating the Urban Forest: The Bare-Root Method describes the process of planting young trees bare-root, and is well worth reading. 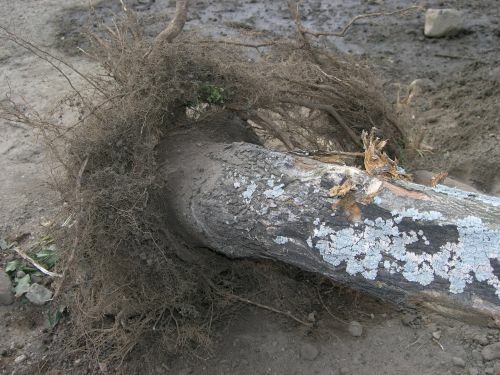 The challenge of using a slurry for large-tree transplanting would be in getting a consistent coating of hydrogel on the roots (you can’t dip the root plate in a tub, the way you can with a sapling root mass) — but there must be a solution (so to speak) to that problem. And finally, aftercare is critical. 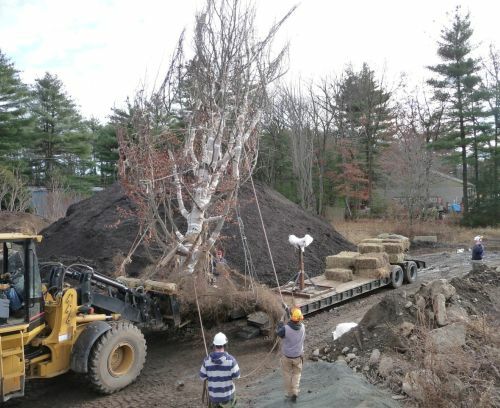 Moving a large specimen tree bare-root takes time and effort, and it would be folly to follow all the steps, get the tree in the ground, and then leave its re-establishment and survival up to chance. Some arborists add fertilizer and bio-stimulants to the backfill, some don’t. What is essential, again, is water. Consistent and adequate water for the first growing season is the best way to make sure that a transplanted tree makes the transition to its new home, survives, and thrives. Watering in a root-washed pin oak at Cavicchio's Nursery. Photo courtesy of Carl Cathcart.